Friday, March 11, Mayor Rodrigo Duterte visited the University of the Philippines Los Baños (UPLB) to governance and transparency forum. However, the visit became controversial and viral because during the forum, a student allegedly insulted the presidential candidate. Mayor Rodrigo Duterte answering a UPLB Student's question. According to an article of Rappler by Pia Ranada, an 18 year old UPLB student named Steph Pablo, who was rooting for presidential candidate Miriam Defensor Santiago, asked Mayor Duterte why do the guns of the army in Davao look better than the rest of the soldiers he saw around the country and will it affect the national budget specially the education share if he won the presidential race. Also, the article said that the students mob Duterte as he enters the venue. His speech was studded with curse words and forceful declarations on his platform. 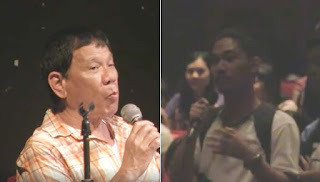 Davao City Mayor Rodrigo Duterte is known to be good at making the audience laugh but during the forum, his reactions and responses are long and winding just like one of the student’s points out. The students were disappointment when the forum was cut because of the lack of time. On the other hand, Facebook Fan Page didn't like how the UPLB student acted during the forum. It posted a video with a caption saying it wishes that UP should teach the student some GMRC (Good Moral and Right Conduct). It also said that the student was very disrespectful and he should learn how to listen when someone is talking. The caption also said that unlike the student, who just talks like he knows everything, Mayor Duterte has done a lot for his city. The video had over 52000 shares and 24000 comments as of this writing. The video earned mixed emotions but it was really evident to see the dismay from different Facebook users are their comments flooded the video expressing their annoyance and frustration towards the student. View the original post from Facebook.